Book News: Vast 'Digital Public Library Of America' Opens Today : The Two-Way Also: an animated interview with David Foster Wallace; the self-publishing trend; and a spirited defense of Justin Bieber. 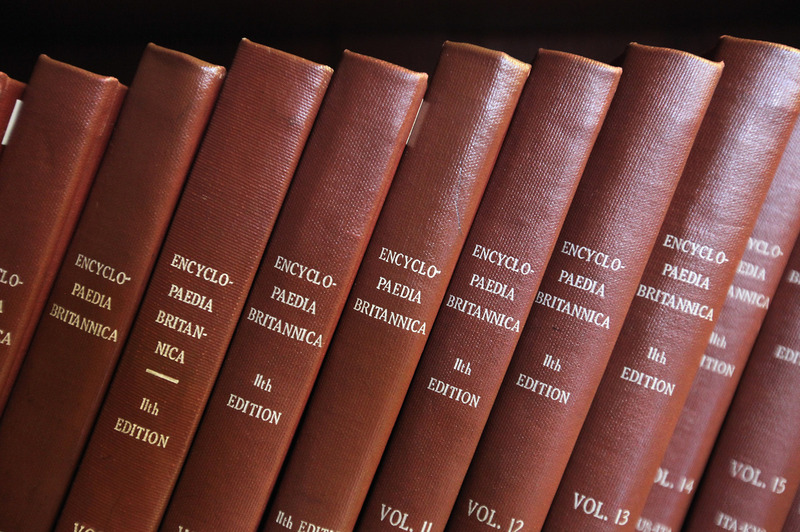 Encyclopedia Britannica editions are seen at the New York Public Library on March 14, 2012 in New York City. The Digital Public Library of America, intended to provide free open access to materials from libraries, museums, universities and archives across the country, launches at noon ET on Thursday. The project began as an initiative at the Berkman Center for Internet and Society at Harvard, and was funded by foundations including the National Endowment for the Humanities and the Institute of Museum and Library Services. Robert Darnton, Harvard University librarian and history professor, writes in The New York Review of Books that "at first, the DPLA's offering will be limited to a rich variety of collections — books, manuscripts, and works of art — that have already been digitized in cultural institutions throughout the country. Around this core it will grow, gradually accumulating material of all kinds until it will function as a national digital library." Blank on Blank, a nonprofit that re-interprets vintage interviews, made an animated video of David Foster Wallace's 1996 conversation with WNYC's Leonard Lopate, in which he explains that "any student whose deployment of a semicolon is not absolutely Mozart-esque knows that they're going to get a C in my class." For The New Yorker, Matt Weinstock writes a thoughtful (and maybe overly generous) defense of Justin Bieber's comment that he hoped Anne Frank "would have been a Belieber": "I think Bieber can be forgiven for thinking of Anne as someone who's still breathing. ... Anne Frank is constantly being resurrected. ... Our collective vision of Anne is always in peril of drifting into somber martyrdom (if you haven't read the diary in a few years, it's easy to think of her this way), and the so-called trespasses on her memory are really vital acts of defibrillation." The London Review of Books gets an email from the stalker described in James Lasdun's memoir, Give Me Everything You Have: On Being Stalked: "His girlfriends are the most hideous." The Review's Nick Richardson writes, "Stalking, a kind of crime passionel, confuses our sympathies: how do you feel about someone who loves you but wants to 'ruin' you; who massages your ego as she damages your career; who has read your books more attentively than anyone else, but slates them on Amazon." The New York Times picks up on a little trend called "self-publishing": "As digital disruption continues to reshape the publishing market, self-publishing — including distribution digitally or as print on demand — has become more and more popular, and more feasible, with an increasing array of options for anyone with an idea and a keyboard."